Exactly. It’s a trick question! There are many difficulties involved in trying to answer this question in a straightforward way. There are simply too many factors to take into account – from existing domain authority and competition to on-site and off-site ranking factors. However, a comprehensive study by Ahrefs may be able to give a more concrete answer than ‘It depends. The Ahrefs team first took 2 million random keywords and pulled data on the Top 10 ranking pages for each of them. The data was clear: the average Top 10 ranking page is 2+ years old, while the ones that rank at position #1 are on the average almost 3 years old. Ahrefs then randomly selected 2 million pages which were first seen by their crawler a year ago, and tracked the position history of each page for any keyword it’s ranked for. After looking through the 1-year-old (or younger) pages at each ranking position, the Ahrefs team discovered that only 5.7% of them ranked in the best search results within 365 days for a minimum of 1 keyword. Going into details on those 5.7%, it turned out that most of them took anywhere between 61 and 182 days to make it to the Top 10. It was also clear from the study that pages from websites with a high Domain Rating (DR) regularly outperform those with a low DR. When the Ahrefs team analyzed data in terms of monthly search volume of keywords, only 0.3% of pages ranked in the Top 10 for a high-volume keyword in less than a year. What this means is that you can rank for low-volume keywords in a very short time, but getting to the top with high-volume keywords will take you about a year. This data, however, only applies to the “lucky” 5.7%. For the overwhelming majority the climb is much steeper and slower. In fact, 95% of all the pages analysed in the study didn’t make it to the Top 10 within only a year. So was it really luck then that got those 5.7% into the Top 10? The real reason has more to do with existing domain authority, hard work, and excellent knowledge of SEO than random good fortune. Existing domain authority is a massive currency these days, by the way. It’s so important that we decided to write a detailed step-by-step guide on hunting down the best expired domains. 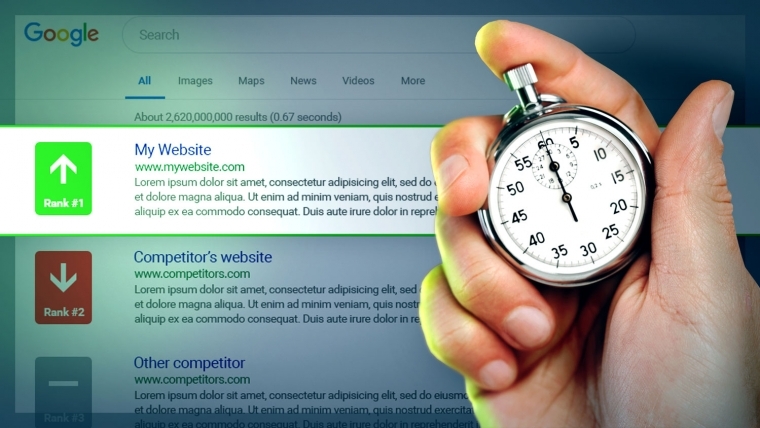 The question of how long it takes to rank in Google is the million-dollar question and while no study, including the Ahrefs one, can give us a one-size-fits-all answer, Ahrefs successfully demonstrated that for the vast majority of newly published pages reaching the top within a year is virtually impossible. If you want to find out more about the results of the Ahrefs study, take a look at the infographic below. Ranking in Top 10 of Google is not an easy task. What are your biggest challenges in SEO?